One of the year’s biggest rock tours just got even bigger: Frontier Touring are thrilled to confirm new show dates on Green Day’s Revolution Radio Australian and New Zealand Tour! After selling out their first date, Auckland fans will be treated to a second and final performance from the Rock and Roll Hall of Fame inductees and Grammy Award winners to meet massive demand – Sunday 14 May at Auckland’s Spark Arena. Adding to the excitement, LA’s own The Interrupters will be joining all Australian and New Zealand shows as Green Day’s special guests. The two bands are no strangers to life on the road together, with The Interrupters currently joining Green Day as openers on the entire 14-date European leg of the Revolution Radio Tour which has already picked up rave reviews across the continent. Made up of lead vocalist Aimee Allen plus brothers Kevin, Justin and Jesse Bivona on guitar, bass and drums respectively, The Interrupters have won fans across the globe with their infectious ska-punk sound. The four-piece’s sophomore album Say It Out Loud was produced by Rancid’s Tim Armstrong and recorded partly at both his and Blink 182’s Travis Barker’s studios – watch the video for lead single ‘By My Side’ here. 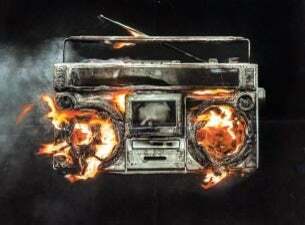 The tour will see Green Day showcasing tracks from their latest album Revolution Radio (out now via Warner Music) - described by Rolling Stone as ‘full of fiery politics and big emotions - including ‘Bang Bang’, ‘Still Breathing’ and the just released ‘Troubled Times’. Don’t miss one of the world’s biggest rock bands at the top of their game with the Revolution Radio Tour. No further dates will be added, so fans are encouraged to act quickly to secure tickets! It is with great pleasure that Frontier Touring announce the return of Rock and Roll Hall Of Fame inductees and Grammy Award winners Green Day to Australia and New Zealand for their Revolution Radio tour. Firm favourites downunder, the April/May 2017 tour will see the band showcasing their new album Revolution Radio (out Friday 7 October through Warner Music). Described by Rolling Stone as an album that’s “full of fiery politics and big emotions”, the first single ‘Bang Bang’ clocked over 1.5 million views in just a week. Produced by Green Day and recorded in Oakland, Revolution Radio is a potent 12-track blitz of angst-ridden anthems that unites Green Day's fully formed stylistic approach with lyrical themes that address the complexities and uncertainties of modern day existence. Musically, the album is raw, visceral, and fearless — solidifying the band's reign as one of the leading voices in rock music.